A small two-cell chapel, probably C11 but altered using C12 to C14 material, which may be from elsewhere; the date of the alterations is uncertain, but the mid-C18 is most likely. Buncton was a parish by 1323, though surrounded by that of Wiston, with which it is now united. Possibly this arrangement emerged because of the pattern of land-holding in the two areas. As a parish it must have been small and in the C15 it was united with Ashington (VCH 6(2) p72), after which it was generally treated as a chapel. Close to the Downs, the church is approached across a narrow, thickly wooded ravine, really more a hollow, which moved Dallaway to describe its situation somewhat improbably as ‘one of the most picturesque and Swiss-like in the neighbourhood’. 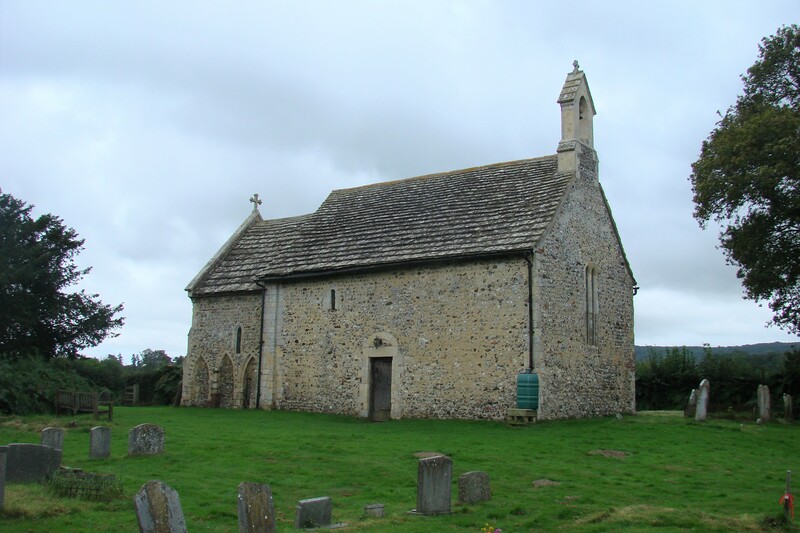 The chapel appears at first sight to be a small C11 structure of nave and chancel, with rubble walling that includes fragments of brick, which, it has been suggested, could come from a Roman villa said to have been found half a mile away (1 p86). The chancel is short (it is broader than it is long) and the nave has round-headed windows. However, only the single north one is original, its head formed from one stone; the two south ones look more recent, though the rere-arch of one of these is directly opposite the north one and must at least represent original work. Inside, the outline of a C11 rere-arch opposite the north window shows that they are not even in their original positions. The doorways look early but the round-headed tympana are filled with rubble, suggesting later alteration. The south one is blocked. The chancel arch at first sight could be C11 or C12. The head has two plain, stepped orders and there are square abaci with nook-shafts. On the north abacus was a rough figure on its side, variously seen as male or female, beneath a double cable-moulding and a row of billetwork; above was a roundel with hatching and what looked like a platter bearing loaves. In an extraordinary act of vandalism all this was chiselled off in 2004 (ET 35 p67). There has been much speculation about the meaning of this arrangement, including the suggestion that it was a sheela-na-gig. However Robin Milner-Gulland (4 p5) points out that such figures, intended to ward off evil, are normally found on the exteriors of churches. He suggests that the figure could represent Adam at the moment of creation with the Creator taking the form of the roundel, citing contemporary manuscripts; the platter could have contained pomegranates, representing paradise. He further suggests that the abacus on the south side, now blank and for the most part visibly later, might have had a related depiction of Eve. There is no means of demonstrating this, but the hypothesis, at least about Adam, is plausible. Milner-Gulland also suggests, on the basis of its primitive form, that the figure could have been older and re-used. In his article he suggests that it could even be Celtic or Romano-British (ibid p4), but more recently David Bone has identified the stone as Caen stone (personal communication from RM-G), which is not found in this area before the C11, though that would not prevent the figure having been re-used in the position it occupied until 2004. The style of the figure would fit in with a dating to the C11. The figure is by no means the only curious aspect of the chancel arch. It is high and wide for so small a church – 14ft 10in high and 9ft 8in wide (Fisher pp69-70). Comparable late C11 ones, eg Chithurst, Ovingdean (East Sussex), Hardham and Selham, range in height from 9ft 6in (Ovingdean) to 12ft (Hardham) and in width from 5ft 8in (Ovingdean) to 6ft 3in (Selham). Hardham, 9ft wide, is the only one that begins to resemble Buncton (All measurements taken from Fisher). 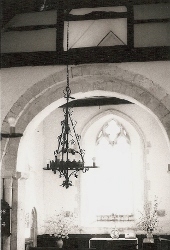 There are also similarities with the undoubtedly C19 chancel arch at Terwick, though that is plainer. Furthermore, on closer examination it becomes apparent that the constituents of the arch do not cohere. For example, a plain piece has been added to the north abacus to make up the required length and neither nook-shaft is straight. An old wooden beam above, crenellated on its eastern side, may be a roodbeam. Above it, there is only timber framing a void, so the arch has no structural function, which is without parallel in the C11. It has been suggested (Parsons and Milner-Gulland p99) that this was intended as a sleeping platform, but taken in conjunction with the many other structural oddities in both the chapel as a whole and the arch, later alterations seem a more likely explanation. The point is made that the arch is built of Caen stone which was not imported after the Reformation (ibid), but that need not be significant if it is accepted that the building material here is largely re-used. One voussoir is carved like a stone of the rere-arch of the south doorway. All this might be the result of later repairs rather than wholesale reconstruction, but in context there are strong grounds for doubt. 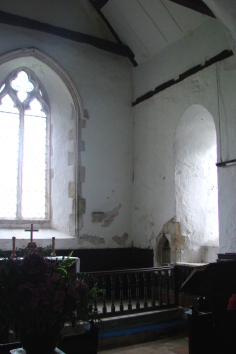 C13 alterations include a pair of west lancets (partly renewed) and single side-ones in the chancel – the south one has a relatively low sill. Also probably C13 is the outline of a half-arch in the south east corner of the nave, probably to create more space for a nave altar. There is a similar one at Coombes. This C13 work seems straightforward, but the chancel presents further oddities. The lower parts of the east wall consist of clumsily laid but well cut ashlar blocks and the ogee-quatrefoil tracery of the east window is distorted, as if from elsewhere, although the moulded hoodmould itself seems to fit. Bloxham (2) believed the chancel was shortened in the C14 and the piscina and aumbry are certainly of this period (see below). There is no way of knowing whether this window was already present in 1636 when ‘the chauncell windowe’ (presumably the east one) was said to be ‘much broken’ (SRS 98 p28). As to Bloxam’s suggestion, it was more usual in the later Middle Ages to lengthen chancels and only archaeological examination could show if that here was ever longer. The side-walls have also been altered. The voussoirs of three pointed wall-arches to the north outside are distorted and intended for round-headed arches, larger than anything at Buncton. The weathered beakhead and pellet mouldings of the eastern ones are not older than c1160. On the south side, under two plain arches, one pointed, the other segmental, are what may have been narrower pointed arches like those in the north wall, but unmoulded. To sum up, the chapel is C11 in origin, but even the basic fabric has been altered. For example, there is no sign outside of the blocked south window. 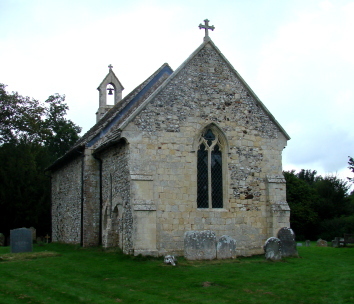 Whatever the date of the east wall and window in their present state, there probably were alterations to the chancel in the C14, for later antiquarianism would hardly have stretched to a piscina and aumbry of the right period, but the side arcading is hardly C14 and was not made for so small a church. As to the date of the changes, the Victorians would never have inserted the chancel arch nor made such a muddle of the chancel and in any case the Sharpe Collection drawing shows the wall-arcading in 1805. 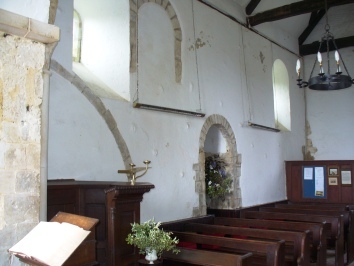 The south east quoin of the nave is dated 1758 and it should be recalled that at Tortington the C12 chancel arch was carefully rebuilt in 1753; 1758 thus seems the most likely date for the work at Buncton. In favour of such a dating is the presence both in the nave and at the base of the north arcading of bricks of C18 type, though in the case of the arcading its presence could indicate repairs; however, it is mostly at the base of the arcading, which might suggest that this had had to be made up in the course of insertion. In the vicinity, there was no shortage of available old material, at Sele priory (see under Upper Beeding), Steyning and Bramber churches and Bramber castle. 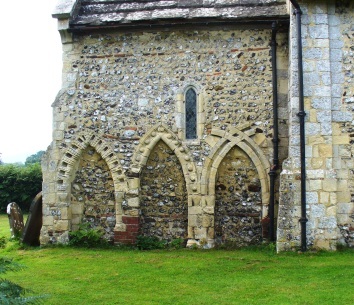 Robin Milner-Gulland (3 p9) inclines to Sele as the source since there is similar ashlar there to that in the chancel and suggests (4 p4) that the material could have been sold off by the notoriously impoverished monks. He notes there is a record of repairs to the priory in c1300, though the presence at Buncton of C14 work that appears reset is unlikely to come from new works at Sele of the same date that included an entire surplus window. If the monks did sell off material, a later date in the period before the dissolution of the priory in 1474-80 (VCH 2 p62) seems preferable, but a date after that time would be equally acceptable. 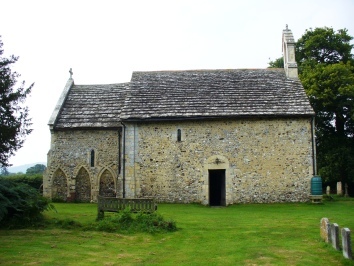 However, the present church at Upper Beeding which was closely connected has been too altered to be cited in any way with confidence. In support of this hypothesis is a tradition that the north arches of the chancel came from Sele. 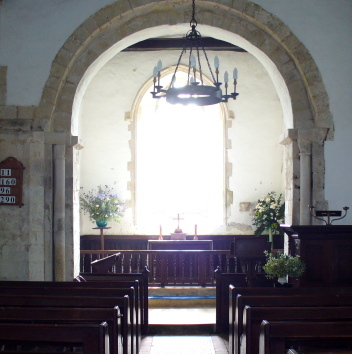 In both his articles Milner-Gulland discusses the chancel arch in some detail, but without addressing the question of whether it is basically original. Even if a C18 date is accepted, it is not easy to explain this later work; the chapel is too far from the nearest great house at Wiston to have been intended as an eye-catcher, which might otherwise have been the reason. The date and extent of C19 repairs are not fully known. The present stone belfry is not shown on a sketch of 1842 (CCC file), but is present in an otherwise poor engraving of 1856, illustrating Blaaw’s article in SAC (1 p186). No south window is visible on this, but in 1871 Bloxam mentions two (2 p203), suggesting there was work between these two dates. 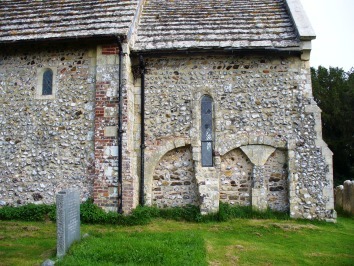 There is also a C19 buttress on the south side of the chancel. The only certain restoration work was in 1906 by G S Mitchell (BN 91 p432) and is said to have included new roofs. These are plastered inside, but the exposed trusses look old, perhaps C14 or C15. Since the work cost only £200 (CDG 154 (1906) p142), complete renewal is unlikely. Aumbry: (Chancel) C14 pointed, with a shelf. 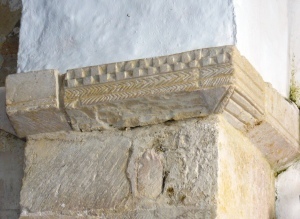 Brackets: (Flanking east window) Two, C14 or C15. Font: Plain octagonal. In the survey of 1602 the lack of a font is noted (SRS 98 ibid), presumably because Buncton had lost its former status as a parish, and this one does not look older than the C19. 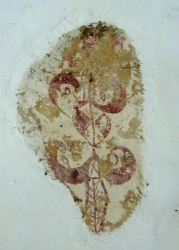 Paintings: (North nave wall) Small piece of decorative work in red. There is said to have been more (3 p10) and it is not possible to date such a small fragment more closely than the C13 or C14. 1. W H Blaaw: Buncton, SAC 8 (1856) pp177-88. 2. J R Bloxam: Buncton Chapel, SAC 38 (1892) pp203-05. My thanks to Richard Standing for most of the colour photographs.